I swear February is the hardest month to get through. Spring’s so close you can almost touch it. Other than obsessively checking the propagator for signs of life, I’ve started a new project. Figs. And that’s what’s got me in trouble. I’ve had cuttings in the fridge for a few months, rescued from branches left for last year’s bonfire. This time I’m trying a different method: they are bundled in damp newspaper, put in a sealed plastic bag and kept somewhere warm till new life shows. 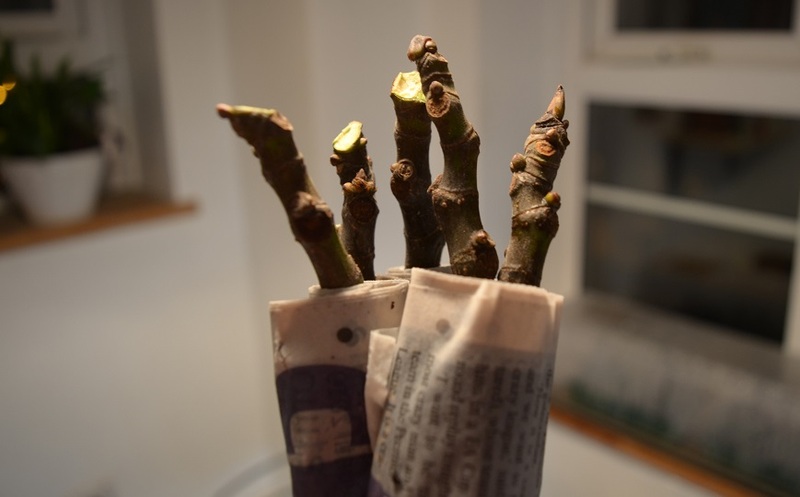 The twigs should send roots into the damp paper, and the bag will keep the atmosphere moist. It’s the ‘somewhere warm’ which is causing issues. In this flat that’s the bathroom, so I’ve put them on top of the bathroom cabinet, out of the way. Him Indoors is protesting strenuously, because they fall off each time he opens the door…Given his love of all things pickled, I’m bribing him with more Middle Eastern turnips. At least the growlights are staving off the annual sighs about trays of seedlings cluttering the windowsill. 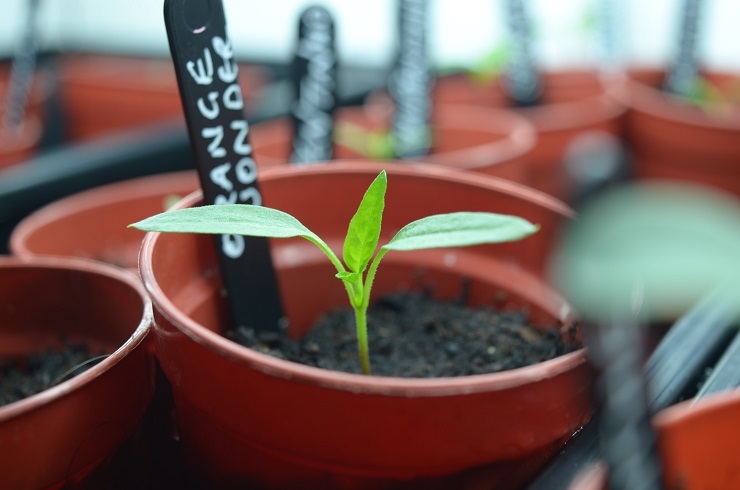 Though that space is already 3/4 full… Of the chillies, Fish and Pasilla Bajio are stubbornly refusing to germinate, whereas Orange Wonder, Satan’s Kiss and Serrano are already showing their first true leaves. I have a few Antigua aubergines poking through and a small tray of Long Red Florence onion elbows. Finally found the packet lurking in the tomato section of my seed box! I’ve moved most of the onions to the greenhouse this week. It’s too warm for them here and they were going leggy. Now that the field beans are in the ground, there is room for a tray of Kent Blue peas, which I am hoping will provide an early crop of mangetout before I need the space for tomatoes. January’s harvests have been calculated. 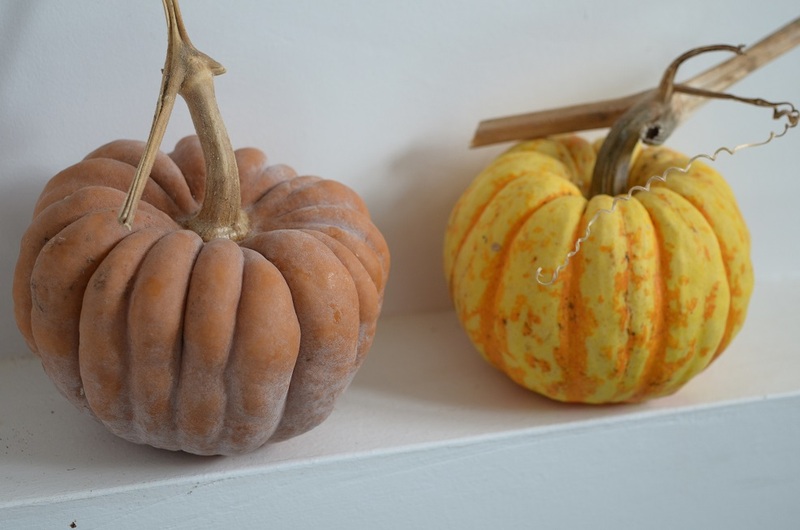 They weren’t massive but I still have lots of food stored from last yea r – spuds, onions, oca, popcorn, squash, beans, tomatoes, jams, plus frozen fruit, sweetcorn and broad beans. 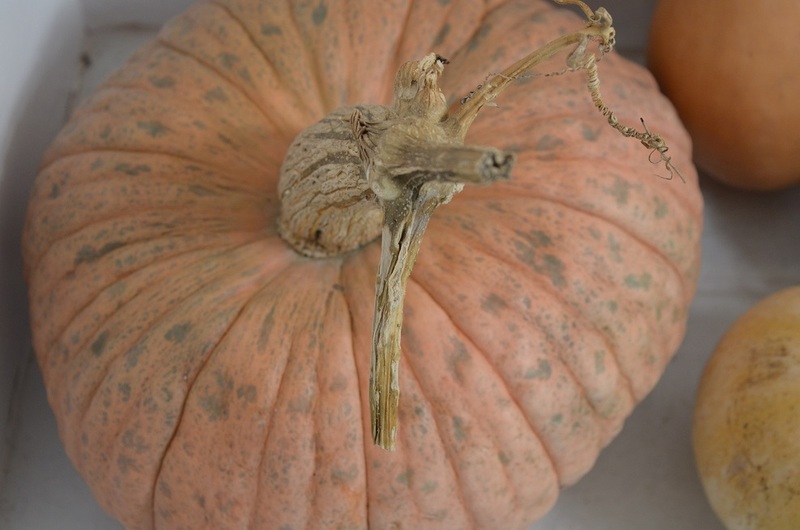 The squashes are developing beautiful colours: Black Futsus are a matt tan, Sweet Dumpling has turned a cheerful orange and Berrettina Piacentina has gone from gun-metal grey to a gorgeous mottled salmon pink. And finally, thank you so much for all the kind comments about the Kitchen Garden review. They are very much appreciated!